I wanted to do a big skull cake, but didn’t want to pay $35 for the cake mold, so instead I paid $3 for a chocolate skull mold and made a treasure chest cake instead. The cake had half chocolate layers and half white cake. All details were made with homemade marshmallow fondant. 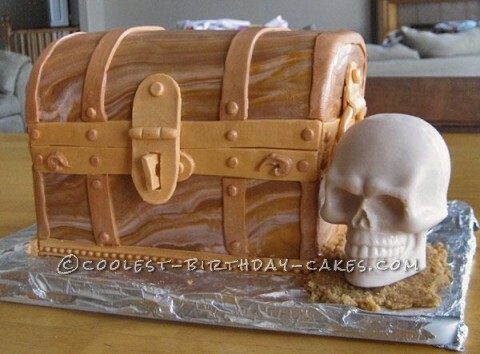 The skull was made from 95% white melting chocolate and 5% regular melting chocolate to get that great bone color. where can I buy the mold for the treasure chest?? The treasure chest itself was just layered rectangle cakes, no mold was used. All the details are just cut out fondant. Let me know if you have any other questions.